REMEMBRANCE DAY PARADE AND SERVICE SATURDAY NOVEMBER 8, 2014 Form-up at Legion at 10:30am March off at 10:45am Service 11 am at Tecumseh Cenotaph Corner of Lesperance & McNorton Streets Pot Luck Lunch will be served at the Legion Branch. Essex Powerlines is hosting a Public Information Session We invite all of our electricity customers to attend our Public Information Session to learn background information on the electricity distributor industry and our 2016 electricity rate application. Thank you wholeheartedly Tecumseh for your support in Monday's municipal election. I was positively astounded by the level of support that you have given me and I look forward to contributing my skills, knowledge and experience in municipal government to provide an oversight ability, customer service and advocacy that is second to none. AndrewDowie.ca is here to stay as a constituency portal. Once I join Council in December, you will be able to find information about upcoming decisions and considerations. I would very much like to receive your feedback on these issues, as well as your own, on this site. Don't be shy, and make sure that you take advantage of the comments section. In the meantime, this site will undergo some cosmetic changes as it evolves to a constituency portal so that it is ready and online in December. You may see links appear and disappear during the testing process. In addition to this site, you can reach me at @Andrew_Dowie, facebook.com/andrewdowie or call me at 519-962-8832. Please do be in touch with what's on your mind. With voting now under way, I’d like to thank you for the terrific reception you have given me at the door. I’m proud to have knocked on every door in Ward 1 during this election campaign and to have engaged with thousands of my neighbours. If elected, this dialogue will remain open. I was the first Ward 1 candidate to launch an interactive webpage at AndrewDowie.ca, Facebook and Twitter to solicit your feedback, and will continue to provide you with town information so that you can be informed of what’s happening within the town. I will champion the completion and implementation of the Tecumseh Road Mainstreet Community Improvement Plan so that we can establish a walkable and accessible core establishing our downtown as a destination and economic driver. You can count on my career as a long-time Civil Engineer for the City of Windsor to work for you. Having managed multi-million dollar capital projects, including basement flooding relief and traffic calming programs, as well as serving in the Chief Administrative Office and Mayor’s Office, I will deliver effective and responsible oversight at Tecumseh Town Hall. My experience also ensures for you informed responses and advocacy backed by a solid knowledge and understanding of solutions no matter what the issue may be. I grew up on Coronado Drive and now call Centennial Drive home with my wife Kristin. I have served on Tecumseh’s Committee of Adjustment since 2006 and Property Standards Committee since 2010. You may have also seen me in the community as a leader with the 35th Tecumseh Scout Group since 2006, or representing our 1700 local engineers as the Windsor-Essex Chapter Chair of Professional Engineers Ontario. It would be a true privilege to serve you and be your advocate for the coming four years. It was just over two years ago that the Town of Tecumseh celebrated the grand opening of Lakewood Park North. For the first time in its municipal history, Tecumseh had a lake front public space that its residents could enjoy that was not the leftover property of a pumping station. This really was a milestone for the town; despite being one of a minority of municipalities located on a body of water, our town lacked any meaningful way of accessing it. It now serves as a community gathering place. I enjoy it most for sitting down with my e-reader and reading while listening to the crashing waves. The property formerly housed the Lakewood Golf Course club house, and was purchased for $7.98 million in 2006. 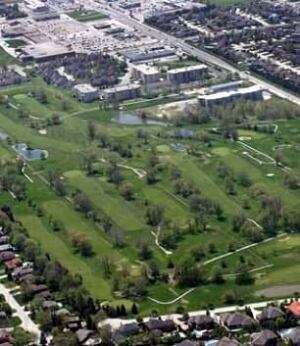 The Town of Tecumseh purchased 2/3rds of the former Lakewood Golf Course (65 of 91 acres) as part of an agreement for $6.9 million. The agreement resolved the Ontario Municipal Board appeals from the former owners to develop the whole parcel as residential lots. The Town has posted the chronological information here. The agreements remain incredibly controversial to this day. The purchases of the two parcels of Lakewood Golf Course remain the number one issue being brought to my attention at the door. The status of the remaining (undeveloped) property has been resolved through a master planning process that concluded a few years ago. You can read the final report for the Lakewood Park South master plan here. There are a lot of amenities being proposed that I find encouraging, including the innovative stormwater system (with meandering path), the naturalized wetland, the outdoor amphitheatre, and the paths. For my part, I am pleased with the Lakewood Park South master plan and look forward to identifying a funding program to support its redevelopment in the way proposed. I also look forward to supporting the development of a Splash Pad at Lakewood Park North as identified in the Town's Parks and Recreation Master Plan. Splash pads are relatively inexpensive means of providing active recreational features to our parkland and, as I have come to learn over the last few months, would be an asset truly valued by the families of Ward 1. Many residents have also observed the construction occurring at the foot of Little River Boulevard. The work being undertaken is to provide upgrades to existing pumping station and to sewer capacity. You can be assured that it is not a precursor to residential development on the town's retained portion of the former golf course. The residential areas will be located on the south and east sides of the property (roughly opposite to St. Thomas St.), as well as on Christy Lane. The use of the property as a golf course permanently ended in 2011 and its physical features have been transformed. I look forward to working with you and to hearing your feedback as to what elements of the Master Plan ought to be prioritized for the property to ensure that it can best serve you going forward into the future. Donald McArthur and Dylan Kristy of the Windsor Star hosted me as part of their Trail Talk series of interviews with municipal election candidates. You can watch my interview here. Enjoy! There is a terrific facebook group called "Tecumseh, Ontario" that I discovered several months ago whose members pay tribute to the heritage of the Town of Tecumseh. The town has undoubtedly changed over the years. Traffic by-passes and plazas have been built, turning lanes added and buildings have been demolished. Within the group are several photos of Tecumseh Road from years passed. Back when it was Highway 39, Tecumseh Road was a vibrant place. Inter-city traffic came through our core. As the region grew lanes were added to let us get home quickly. What is now County Road 22 took regional traffic away from the town core and left what was remaining to be reclaimed for its initial, local purpose. Today's Tecumseh Road has many common elements of the downtown of yesteryear, but we've lost a key component. We have lots of departing vehicle traffic but the corridor sees relatively little foot traffic. Tecumseh Road is still designed to be Highway 39 and as a pedestrian it still feels as such. Therefore, parking and walking the strip on a 4'-wide sidewalk is a less than pleasant experience when you're by foot, especially in the winter when there's a fair amount of ploughed snow drifts. Looking at some of the quaint little towns that my wife Kristin and I enjoy visiting - Elora, Jordan, and St. Jacobs come to mind, as well as the Walkerville community - there is a lush, historic nature to them that brings us back. The pedestrian connection is a key part of the street. Your day includes a loop including each side of the street and visiting the distinctive shops of the area. Bringing Tecumseh Road back is the community improvement that I would like to focus upon most if I am elected to Council. I have been involved with streetscaping and other urban road design projects throughout my engineering career and have seen the positive results firsthand. I look forward to seeing the results of the Tecumseh Road Mainstreet Community Improvement Plan that are so far unreleased to the residents of Tecumseh, although the findings of the 2012 workshop can be found here. And once brought to Council for adoption I look forward to supporting and prioritizing this project. There are numerous reasons why - employment, assessment growth, aesthetics. For me it's a sense of pride in our Town and a way to recapture our history, to give our town some life and help to flesh out our back story. Given the quality of life improvements we experience when we bring in active transportation, new businesses and services to the town, this would be an investment having a solid return. I would very much appreciate if you can contribute your comments about Tecumseh Road to me through my new survey at http://www.andrewdowie.ca/tecumsehroad . I look forward to reading about your ideas and your thoughts. What kinds of corridor would you like to see Tecumseh Road become? Let me know, and from the outset I thank you very much for your interest and for your information.